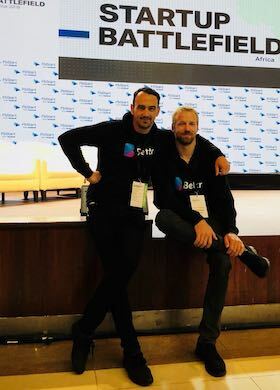 Bettr, the South African virtual banking platform set to launch in 2019, was one of 15 startups to pitch at Africa’s edition of TechCrunch Startup Battlefield in Lagos on 11 December 2018. Some of Africa’s most promising tech newcomers took to the stage to present their ideas in the hopes of winning the $25,000 equity-free cash prize, a trip for two to TechCrunch Disrupt in San Francisco 2019 and the esteemed title. After the success of the 2017 event in Nairobi, Kenya, the Lagos event was the second TechCrunch Startup Battlefield to take place in Sub-Saharan Africa. This time around, the organisers reviewed hundreds of African startups to arrive at a list of 15 semi-finalists. With TechCrunch Startup Battlefield’s 2% acceptance rate, it was stated by one of the organisers that it is easier to get into Harvard. Each company was given 6-minutes to pitch and share a live demo to a sold-out venue and panel of judges. Tobie Van Zyl delivered a thought-provoking presentation, commenting on the shortcomings of the traditional banking industry and how Bettr will reinvent this ‘broken system’. Andrzej Stempowski (Chief Technical Officer) conducted a live demonstration, showcasing how an account can be opened using only a South African identification document. The full pitch, with more details about the soon-to-be-released product, can be watched on the TechCrunch website. The pitch impressed the judges, resulting in Bettr being selected as one of the five finalists. The startups delivered their same pitches a second time to a new panel of judges, followed by a thorough Q & A. The final-round judges included Dapo Olagunju, head of West Africa JP Morgan and Konstantinos Papamiltiadis, director of developer platforms and programs for Facebook. The panel selected M-SCAN as the winner, a Ugandan based startup that has invented a mobile ultrasound that is portable and compatible with basic devices, including a mobile phone. Second place went to Bettr. “Being ranked amongst the top 15 startups on the continent is a great achievement for us. Coming in second is an absolute honour when you’re competing at this level of innovation.” – Andrzej Stempowski, Chief Technical Officer of Bettr. ABOUT BETTR: Bettr is a virtual banking platform powered by your smartphone and a transactional card. Together with their community, the Cape Town based team are co-creating a financial future for all. The startup is set to launch their product to the public in 2019, giving South Africa’s unbanked access to financial empowerment like never before. At the centre of the new banking platform will be the Bettr Network, connecting people to opportunities and choice.